We have no affiliations with any other clubs, groups or political bodies. For further details please read our Constitution and Rules. The best way to get in touch is via email (info [at] luton-lambeg.org). December 2007 - Some of the site content is being updated, and some of the older content is being removed. We apologise for any inconvenience. The intention is to make the content more relevant for 2008. Luton and Bedford Drumming Club joining Lord Laird for a marvellous day of cultural expression and celebration. Col Tim Collins playing the lambeg drum. 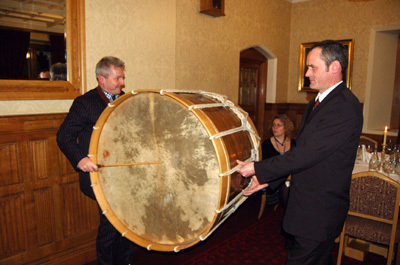 The lambeg drum is iconic in Ulster Scots culture. The drum shell is typically oak, and has two (huge) goatskin heads which are stretched over what are known as flesh hoops. Brace hoops and ropes are used for tensioning, the lambeg often being placed into a specially constructed press to make the job easier. The drum is pulled very tight (gauging the point at which the drum is 'at her best', without ripping the goatskin heads). This is something of a art in itself. Resisting the desire to pull the drum tighter can be difficult!. A lambeg weighs about 40lbs (some of the brass shell drums are heavier) and are carried around the neck using leather staps. The drums are built for noise (easily capable of 120 decibels), not comfort and are difficult to walk with at any pace and are played with malacca canes in rhythms known as 'times' or drumming tunes. There are a number of styles of lambeg drumming roughly divided into two categories (time drumming and club drumming). Club drumming is a competition style and is used to 'show off' the capabilities of a particular drum. Time drumming on the other hand essentially means drumming in time to a fifer playing hornpipe tunes (mostly of Scottish or Irish tradition) in a modified rhythm. The aim of the club is to promote traditional Ulster Scots / Scots Irish fife music and time drumming (lambeg drumming styles). We have a significant collection of tunes and drumming styles, please expore our music sections for further details. 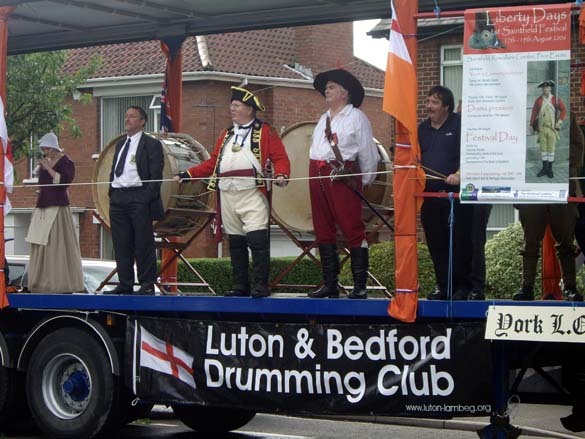 Formed in 2005, Luton and Bedford Lambeg Drumming club works to promote Ulster Scots traditions on the UK Mainland. We play lambeg and rattly drums (Ulster rope drums), traditional fifes and draw our membership from various regions of Southern England. The club’s inaugural parade was in September 2005, supporting the Grand Orange Lodge of England annual outing to Southport. The following week the club paraded with Luton and Bedford branch of The Browning Club at the Lord Carson Memorial parade in central London. The route took in the Embankment past the London Eye, the Palace of Westminster and Downing Street, and the lambeg drums were greatly admired by tourists, onlookers and supporters. A notable highlight for the club occurred in November 2005, accepting a kind invitation to attend a function at The House of Lords. If you are interested in the style of music we play or traditional Irish and Scottish music, check out our Ulster Scots music pages for more information.